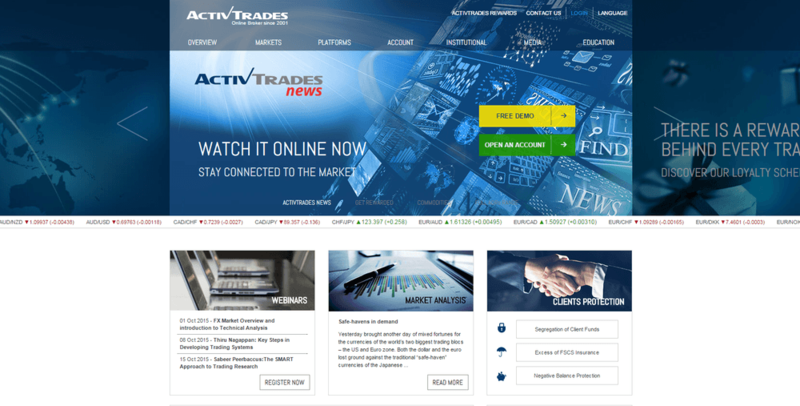 ActivTrades is an international broker founded in 2001 which is headquartered in London. The broker provides direct access to the world stock markets. The broker`s clients can trade over 50 currency pairs, shares on the EU and US stock markets, gold, silver, crude oil, and other commodities through the MetaTrader 4, MetaTrader 5 and ActivTrader trading platforms. All clients are entitled to get bonuses which they can exchange for valuable gifts or use them to cover the cost of VPS, advisors etc. The company rewards its clients regardless the number of their trades. ActivTrades Client Support works 24 hours a day, 5 days a week. The company provides automated execution of orders with the use of no dealing desk system. Add comment Interested in other brokers? I’ve been trading in forex almost 3 years and I never get problem like activtrades. Their Mt4 platform have major drawback in term of execution and also not stable make the platform crash after 4 hours running the platform. It will be worst when it comes with market that have high volatility it will easily freeze and make you loss your position if you want to close the profit position manually. I’m only make one time deposit because I would like to try their system first and to see if it suit with my trading style but my initial deposit almost margin call because of this problem and their support don’t even want to help you at all. Overall I’m not recommend this broker if there any trader want to their services. 5 month ago I was recommended ActivTrades broker by my sister, but now I want recommend this broker to all traders that willing to make money. In ActivTrades , I can trade without many complicated numbers and settings and withdrawal process also get well as promised. Yesterday I make withdrawal request and my withdrawal of USD300 were smooth through international wire transfer. In every trading of course there are some problem and I got it even in this broker. But my problem when the withdrawal of money is settled very quickly. I contact their support and then I get a fast service with executions that carried out as soon as possible. I am glad I choose this broker. ActivTrades is a liar, so don’t join trading with this broker. Trading with ActivTrades for 1 year, I just got loss with this broker. Therefore, I decided to leave this broker 3 months ago, because I think it’s enough for me after having worst trades at here. I traded in forex 5 years, so I have experienced with many brokers. Hence, I know how to manage risk in trading, but I can’t accept all my losses at this broker. At the beginning, I put 500$ to trade, and I got loss. However, I continued depositing more money, unfortunately I still got losses. During that period, I lost lots of money with over 1000$, and I think this broker robbed of my money. Thus, I always got some issues from them such as: frozen platform, unstable connection, high spread, etc that makes me always get loss. I was upset with this broker, so I quit trading with ActivTrades by closing my account. In fact, this broker doesn’t let me do this, they ask me continue trading or leave the rest of amount in my account. Finally, I loss the rest of money in my account with this broker, and I left them. Generally, be aware this broker - ActivTrades because they just take your money to their pocket. ActivTrades is really a thief!!! trading with activtrades is not easy like other broker that I’ve use. Their platform is worst in term of execution and also not stable make the platform crash after 2 hours use in trading. When it comes with market that volatile their platform will easily freeze and make you loss in your position if you want to close the profit position. I’m only make one time deposit because I want to try their system first and my initial deposit almost margin because of this problem and their support don’t even want to help you at all. I have used MT4 interbank account with ActivTrades brokers. This platform execution so fast and for professional traders as like me. I also find on the major forex pairs as like EURUSD and USDJPY they provided 0.5 pips tightest spread and hasn't any commission. I also prefer a wide range of instruments which they providing in the industry as smartpattern, smartforecast, smartorder, smartLines,s Smarttemplate. I think with ActivTrades for over three years I didn't face any major problems at all. I have a lot of successful withdrawal processing $20 to $1k via bank wire. So recommend ActivTrades as a professional broker. I have been using Active trades for few months and also have introduced by a friend who is also a trader. I found that, spread is not fixed and increasing especially during night especially for major currency pairs. Also as a broker, they have to discuss frankly with traders about any fees and commission so that it could not lead to any misleading information. Since there are too much information also caused confusion and I am not really confident with them and currently plan to quit and look for other broker. I don't like to trade with this broker. As other users mentioned, all are losses because performance of its trading platform is very poor. Support managers don't reply your concerns, so it's a bad service. Honestly say services are perfect what i think is good point of this broker. Marketing have quite well but is not worth a slot as they promised there. This broker doesn't really provide negative balance protection, my experience with this broker have not been good at all.They canceled my profits of more than $18,000 and they deleted all my trading history. This made me to leave this broker, they don't even allow scalping. First deposit is good, execution is kind of low, but spreads are great, I have beentrading for a few months and till now, no problem. Web-portal Administration warns you that the data provided by Forex companies are for informational purposes only. www.ratingfx.com team is not responsible for the loss of customer funds when trading on Forex through the use of information contained in this resource.